A new online tool charts a commodities’ journey from production to consumption, and can aid companies and practitioners’ efforts to cleanse deforestation from supply chains. The sector is calling for more transparency tools as it faces greater policy uncertainty with the election of Donald Trump as President of the United States. 16 November 2016 | MARRAKESH | Morocco | Nearly 200 companies have endorsed the New York Declaration on Forests (NYDF) – a ten-goal pledge to save the world’s forests. Until now, however, watchdogs have had little way of knowing if those companies are actually keeping their promises, while companies themselves have often struggled to find ways of delivering them. Several transparency initiatives were either launched or announced at this year’s climate talks in Marrakesh, Morocco, including more than a dozen research papers and at least two new tracking platforms. The Center for International Forestry Research (CIFOR), for example, launched a satellite-based deforestation tracker at the Global Landscapes Forum, which CIFOR hosts alongside the formal talks, while the Global Canopy Programme and Stockholm Environment Institute launched a platform called TRASE, (Transparency for Sustainable Economies), which makes it possible to track soybeans from specific municipalities in Brazil, through traders, to end countries. Goal 2 is broken into four parts with indicators to go along with each. The second part, for instance, is implementation of private sector commitments, and indicators explore if a company adopted policies related to deforestation. 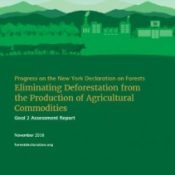 The fourth part, however, tracks the overall impact a companies’ pledge is having on reducing forest loss, and Climate Focus’ new assessment on the NYDF wasn’t able to report any progress because there is currently no available data to determine whether corporate commitments to reduce deforestation are translating into real reductions. “We have almost no way of monitoring the effectiveness of these private sector pledges, if they are implemented successfully and whether they are resulting in a reduction of tropical deforestation,” the Co-founder and Director of Climate Focus Charlotte Streck said during an event in Marrakesh. “It’s difficult to make the connection between the commitment by the company and the actual reduction of deforestation on the ground,” said Marco Albani, the Director of Tropical Forest Alliance (TFA) 2020, an umbrella organization uniting the efforts of several entities including companies and governments to end deforestation tied to forest risk commodities. He mentions other factors affecting land-use such as national and sub-national policies and smallholder farmer activities. The CIFOR initiative uses satellite technology, combined with information from the Indonesian government, to differentiate oil palm and pulpwood companies who practice deforestation from those who don’t. It launched today with full coverage of Borneo in Southeast Asia, the world’s largest source of palm oil and a significant source of pulpwood. Trase, on the other hand, is a digital tool that tracks commodities from the place of production to the countries of consumption. Such transparency has become key at climate talks here, especially with the uncertainty introduced by the election of Donald Trump as President of the United States. Trase will work in coordination with Forest Trends’ Supply Change, which tracks corporate disclosure and action related to deforestation and informed the NYDF report, and other initiatives including the Forest 500 and Global Forest Watch. “We’ve had huge advances in spatial monitoring and satellite monitoring perhaps best embodied by Global Forest Watch so we can see more closely into places and the impacts in those places,” Mardas said. Despite these advancements, though, there is still a gap in linking downstream actors – those with the strongest commitments – with what’s happening on the ground, he added. Though, we shouldn’t feel too disheartened about the lack of information on the origins of commodities as companies have never been asked to keep track of where their commodities come from, Albani said. Tools such as Trase and CIFOR’s tracker can help. Trase also includes data on deforestation, biodiversity and conservation risks as well as information on social and governance conditions. “The nature of this data is that it covers the entire sector so we get a very broad blanket of coverage but also granular enough to inform decision-making,” Mardas said. Trase is currently in beta and while it only covers soy exported from Brazil right now, developers plan to cover all commodities associated with tropical deforestation. As practitioners move to increase transparency, the private sector continues to ramp up their commitments to reduce forest loss. The current total sits at 415 companies and 701 commitments with the lion’s share addressing palm oil and wood products. Commitments to soy and cattle drop considerably below palm and wood, which is a significant concern as cattle has a deforestation footprint nine times larger than that of palm, report authors write. “The good news is that global supply chain movement continues to gain momentum,” Donofrio said, speaking on findings and trends of this year’s NYDF assessment. The majority of companies that have made pledges are manufacturers and retailers headquartered in the US, Europe and Australia though Donofrio notes that trend may be changing. More palm oil producers in Southeast Asia and meat processing companies in Brazil are making commitments of their own. Meanwhile, NYDF and TFA 2020 endorsers continue to lead the pack in adopting commitments and implementing policies across all supply chains. Albani, like many in the space, note the progress the report shows – but also the dwindling time to act.